When there is a small child in the house - it is a great happiness. However, at the age of one year old, a child who is weaned from diapers may “please” his parents with a spot of urine on the mattress. How to get rid of this type of pollution, you need to know every new mother. However, how to wash out the urine mattress is information that is also useful to pet owners (cats or dogs). After all, if the surface is not treated in time, an unpleasant smell will appear that will not please any family member. The challenge is to remove stains and neutralize odor. This method is especially good when it comes to cat urine, which has a very sharp and unpleasant odor. If a misunderstanding has occurred recently, and the hostess is at home, it is advisable to clean the mattress as soon as possible. Paper napkins are laid so that more urine is absorbed. Another interesting option - you can use the usual absorbent filler for the toilet for cats. The main thing is that the granules were small. They are poured onto the stain, pressed down a little and left for about 30 minutes. After this time, cleaned with a vacuum cleaner. Then the stain can be wiped with a regular cleaning agent. In the event that urine is already ingrained in the mattress and dried, the principle of purification will be different. Use a damp sponge to moisten a little. This is necessary to ensure that the cleaning solution is better manifested its properties. Now vinegar comes into the fight. It must be diluted with water in the proportion of 1 to 3. The resulting solution is evenly applied to the mattress. In order for it not to start spreading around, you can put a paper napkin on top. After that, you must wait until the vinegar is completely dry. A thin layer of soda is poured on the stain. It is important that the layer is uniform and a little beyond pollution. Hydrogen peroxide 3% (approximately 100 ml), a teaspoon of dishwashing liquid and simple boiled water of room temperature are poured into a container with a spray nozzle. Total should get 200 ml solution. Cooked according to the recipe described above, the solution is well shaken up and sprayed onto the stain, where soda was previously poured. A chemical reaction should start and a stable foam should form. It is left for at least 2 hours. The reaction that occurs between soda and peroxide contributes to the release of large amounts of oxygen. As a result, the most caustic ingredients of the urine composition are broken down. 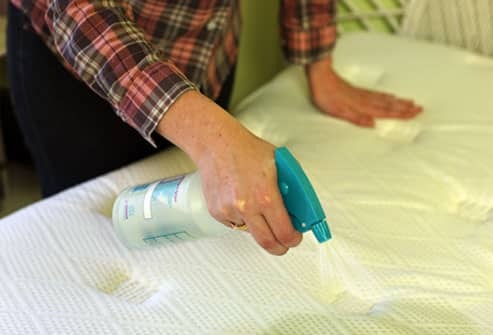 When the question arises how to remove the stain on the mattress from the urine quickly and efficiently - this method would be an ideal option. Thus, the hostess will be able to remove the most caustic stains and unpleasant smell. Borax is a universal disinfectant used by manufacturers in the manufacture of detergents. Buy product in its pure form can be in the form of powder. Few people know that using this tool is very easy to remove stains on the mattress from cat or child urine. The main advantage is that sodium tetrabonate does not adversely affect the color and fabric. At the first stage, similarly to the previous case, it is necessary to get rid of the bulk of urine, paving the contaminated place with paper napkins. If the stain is old, it is slightly moistened with plain water using a sponge for washing dishes. Now the borax comes to grips. The powder is poured on top of the pollution, it must be thoroughly rubbed into the mattress so that it penetrates into the inner side. It is important to perform these actions in rubber gloves. Despite the fact that sodium tetrabonate is considered to be a safe means, it still negatively affects the condition of the skin during prolonged contact. Now it remains to wait until the treated place is completely dry. When this happens, residues must be removed from the surface with a vacuum cleaner. Borax is a very effective remedy for persistent urine stains. The powder affects the structure of pollution, prevents the formation of an unpleasant odor, whether it be children's or cat excrement. These methods are suitable for removing "yellow" dirt from almost any surface. This may be furniture made of chipboard, upholstered in fabric, mattresses and sofas, carpets. In any case, it is necessary to choose a cleaner for the pollution, depending on whether there is an old urine stain or not, whether the solution will damage the surface texture. If a small child or a cat decides to defecate on the carpet, it is recommended to start removing the stain as quickly as possible, so as not to have time to smell. The methods listed above are suitable for this. You can also buy in the store special cleaning products made specifically for carpet. With their help, pollution is removed very quickly, the process takes a minimum amount of time and effort. As for mattresses - the best way to cleanse with peroxide and soda. The solution prepared according to the recipe neutralizes stains and unpleasant odor not only on the surface, but also on the reverse side of the fabric. In addition, soda and peroxide do not damage the surface of the mattress, this is especially important for orthopedic models. In case of careless handling, the basic properties of the product may be lost. Before removing stains from the mattress using any of the methods listed above, you must wear rubber gloves. Not important, the hostess decided to use sodium tetrabonate solution or peroxide with soda, prolonged exposure with any means can adversely affect the condition of the skin of the hands. When working with vinegar, be sure to open the window so that fresh air enters the room. The specific smell of the product may cause slight dizziness and discomfort. Regardless of the method used to remove the stain, initially it should be either moistened (if old), or laid with paper napkins (if fresh). If possible, you need to get rid of the spot as soon as it appeared. This will be easier and there will be less likelihood that urine will pass through the tissue. How to wash urine from a mattress is a question about which hostesses do not think very often. Knowing several effective methods of cleaning pollution does not hurt. Every woman sooner or later becomes a mother, it is also possible that the lady will want to have a pet at home. How to remove the stain from the usual ballpoint pen without traces and consequences?